How about Robert Griffin III in a 49ers uniform? Clayton, in an interview on 95.7 The Game, said that if the Niners decide to trade or release Colin Kaepernick, Griffin would be a good fit in Chip Kelly’s offense. Griffin officially was released by Washington Monday morning. The former Heisman Trophy winner from Baylor was the No. 2 overall pick in the 2012 NFL draft by Washington and was the league’s Offensive Rookie of the Year that season. But injuries, coaching and system changes and the ascension of backup QB Kirk Cousins caused Griffin to fall from favor and lose his starting job. After starting 15 games as a rookie and 13 in his second season, he started just seven in 2014 and none in 2015. Early in his career, Griffin was a dynamic playmaker. He had a strong, accurate arm and good feet. His head coach, Mike Shanahan, said he believed Griffin would be a star for a long time in the league. Now Griffin, just 26, is looking for a chance to get his career back on track and the 49ers’ quarterback situation – with Kaepernick indicating he wants out of San Francisco – is in flux. With Kelly’s spread attack requiring a quarterback with Griffin’s skills, it seems the 49ers would be a nice fit for RG3. But he likely will get a number of offers. The Los Angeles Rams, Houston Texans, Buffalo Bills, Philadelphia Eagles and Cleveland Browns rank among possible top suitors. When 49ers general manager Trent Baalke was asked in February about his team’s possible interest in Griffin should he be released, he didn’t discount it. 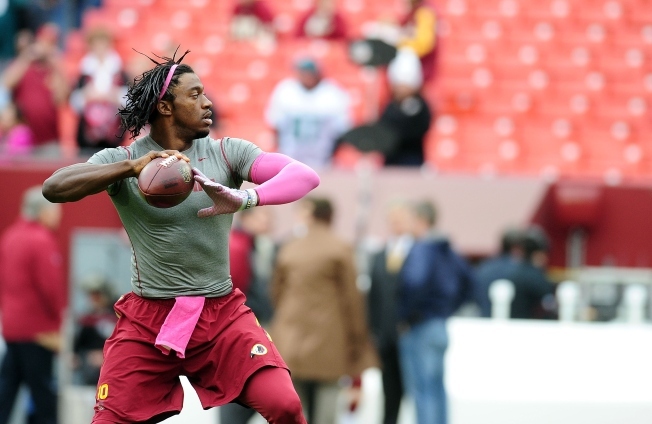 With RG3 now on the market, that avenue will be crowded with NFL suitors.